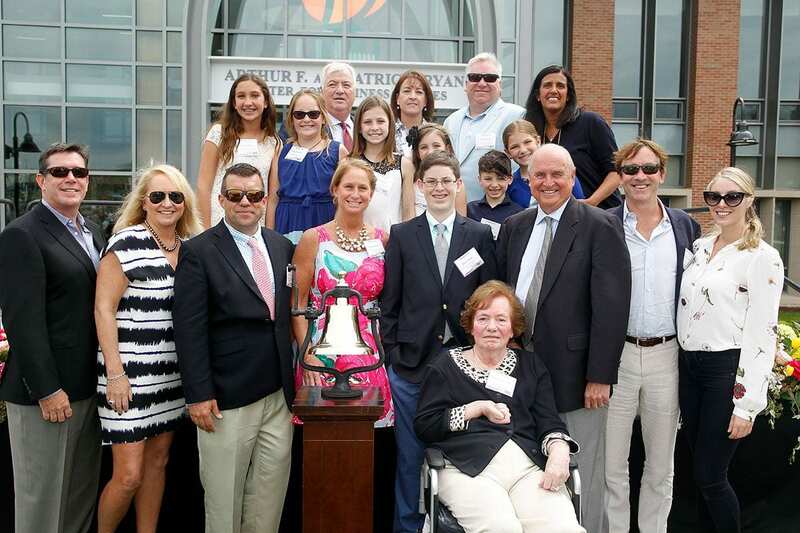 Arthur F. Ryan ’63, ’90Hon., & ’89P, his wife, Patricia, and their family at the dedication of the Arthur F. and Patricia Ryan Center for Business Studies in 2017. Patricia E. Ryan ’89P, whose gift with her husband, Arthur F. Ryan ’63, ’90Hon., & ’89P, led to the construction of the Arthur F. and Patricia Ryan Center for Business Studies, the home of the Providence College School of Business, died on Sunday, May 6, 2018. The Ryans also donated to the construction of the Smith Center for the Arts, where the Ryan Concert Hall is named for them, and they established the Arthur F. Ryan Family Scholarship Fund. “While Pat Ryan became part of Providence College through her husband, Art, we will forever treasure her own example and generosity,” said College President Rev. Brian J. Shanley, O.P. ’80. In addition to her husband, Mrs. Ryan is survived by her children, Kyle and Art Ryan ’89, Kelly and Kevin Donovan, Denise and Kevin Ryan, and Kathleen and Ethan Theune; and seven grandchildren. She is also survived by her brothers and their spouses, Mr. & Mrs. William Kelly and Mr. & Mrs. John Kelly. Services will be held at Strunk Funeral Home in Vero Beach, Fla., on Wednesday, May 9, from 6-8 p.m. and Thursday, May 10, from 2-4 p.m. & 6-8 p.m. The funeral Mass will be held at Holy Cross Catholic Church on Friday, May 11, at 10 a.m. In addition, a memorial service will be held in early June at the New Jersey Performing Arts Center, Newark, N.J.